Anthony J. “Tony” Prignano was born and raised in Melrose Park. He is the son of Hannah and Anthony Prignano. Tony’s father, Anthony, was Chief of the Melrose Park Fire Department. Tony graduated from Melrose Park School and attended Proviso Township High School. Tony is married to another lifelong resident of Melrose Park, his wonderful wife, Josephine Salinardi Prignano. Josephine and Tony raised three children, Joseph, Anthony, and Mary Jo. Today, they reserve their bragging rights for their four amazing grandchildren, Matthew, Giana, Talia and Joseph, Jr.
Tony Prignano worked for many years at Triton College as the Associate Director of the Physical plant. He is now retired. 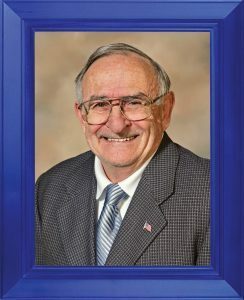 Throughout the years Tony enjoyed a long and diverse career as a volunteer coach at Our Lady of Mt. Carmel School. Tony coached a variety of sports there, including basketball, softball and track. He even coached a young Mayor Ron Serpico. Later, Tony became a fixture on the local baseball circuit, coaching many Melrose Park Little League and Colt League championship baseball teams. Tony has served as a Melrose Park Village Trustee since 2001. Not only has he served with distinction as a Trustee, he has also brought his unique brand of energy and ideas to the many other committees he has been a part of. He has continually proven himself to be a diligent and forward thinking Trustee whose confident leadership has helped make Melrose Park a better place to live.